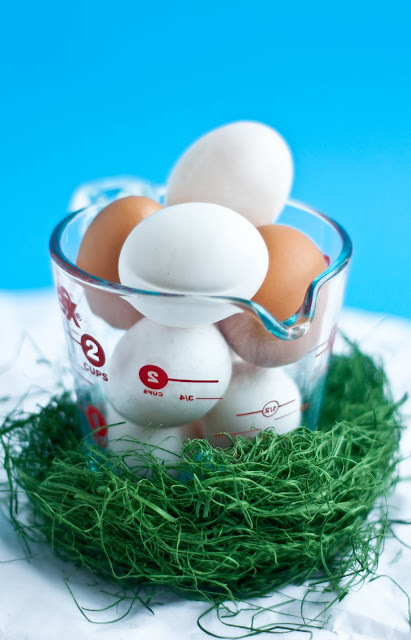 Sunday was Easter, so I thought that today, we should talk about eggs. Or, rather, I thought that we should talk about things that remind us of eggs. Like, passion fruit. Which is what I thought about this Easter. I mean, come on--do you blame me? 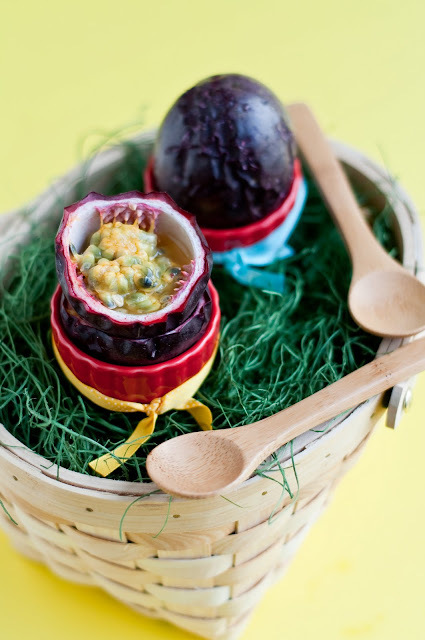 Passion fruits (when they're not completely shriveled up) totally look reminiscent of eggs. In fact, in my family, we always joke that they're like alien dinosaur eggs because of how weird they look when you cut them open. 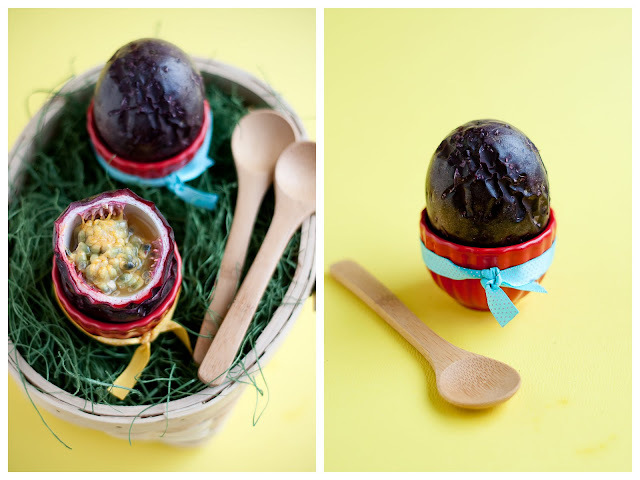 So, of course it was natural for me to be thinking about weird looking dinosaur eggs during Easter (yes, that's just how my messed-up brain works--Kids: this is your brain on graduate school. Take note.). Anyways, I also associate a feeling of down home simplicity and nostalgia with Easter, and so I thought nothing would be more fitting for our Easter celebration than combining dinosaur/alien eggs with homey goodness in the form of passion fruit whoopie pies! I have been meaning to make whoopie pies for quite a while now. It falls into that family of frosting-sandwiched-in-between-baked-goodness that I love so much, along with the also-nostalgic sandwich cookie or the high-class, snobby French macaron. Whoopie pies are basically what would happen if you took a cupcake and converted into a sandwich form, which, in my humble opinion, is a genius move. 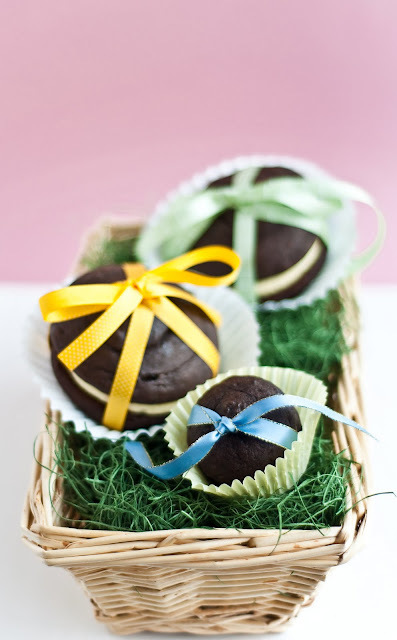 For my whoopie pie cakes, I used an adaptation of the recipe published a while ago in the New York Times. One concern I had when embarking on making whoopie pies were that the cakes would be super dry, which is how some of the proprietary ones that I've had are like. And there's really nothing I can't stand more than dry cake. Ugh. But, my worries were for naught, because these cakes turned out beautifully moist and dense. They were sooooo, sooooo good. Like, I-almost-skipped-the-frosting good. To kick up the chocolate quotient even more, I used black cocoa powder in addition to regular cocoa powder, which made the batter awesomely dark. The cakes turned out super chocolate-y and ever so subtly sweet, which were perfect for the sweet, fruity frosting that I had planned. For the frosting, I adapted a vanilla frosting recipe found here with vanilla bean and folded in passion fruit curd. The result was a tantalizing flavor combination of citrus-y, tangy, and sweet passion fruit frosting, with dark and moist chocolate. Um... yes! To make the passion fruit curd, I used a syrupy passion fruit nectar that you can find bottled in Asian supermarkets so that the passion fruit flavor would really come out robustly through the chocolate cake, though fresh passion fruit juice should also work as well. 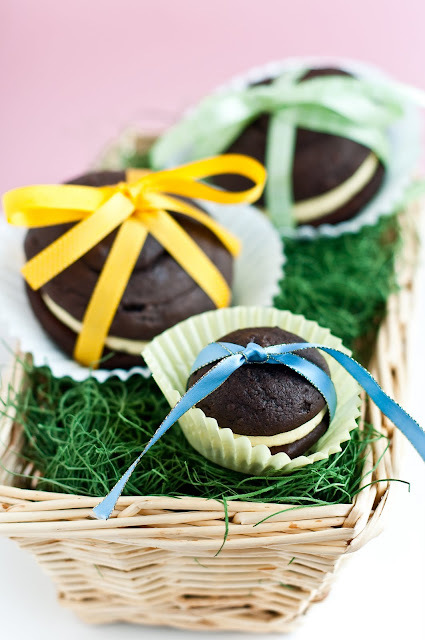 These "passionate" whoopie pies went over really well at Easter. I credit their success to the combination of moist chocolate cake that isn't too sweet and the surprising punch of passion fruit frosting in the center. And, all in convenient sandwich form, too! I made some little, two-bite size whoopie pies (or one bite, depending on how big your mouth is ;-P) that my mom took with her to her office. 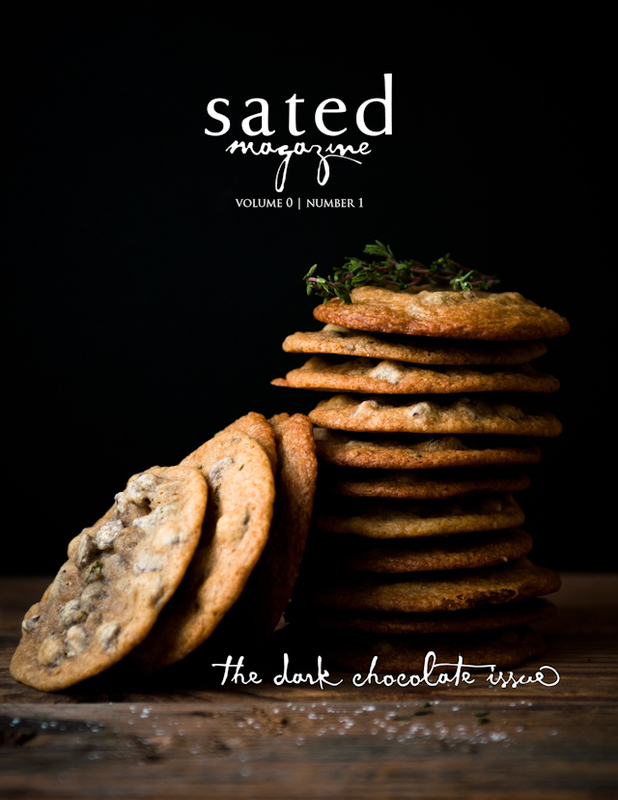 Apparently, people lamented to her about only having one bite-size whoopie pie per person, and, honestly, I feel for them--I can't just eat one either! Anyhow, I hope you all had a wonderful Easter weekend! This week's going to be a super busy one for me: I'm running a workshop this coming weekend with many of the leading researchers in my field, which promises to be at once excellent fun but also crazy work leading up to it! (Wish me luck surviving!) But, I have some really, really exciting things in the works for the blog for next week. Like, black cocoa. Stay tuned for more about that in a few posts or so! 3. In a bowl, mix the flour, cocoa, black cocoa, salt, and baking soda. Set aside. 5. Add the egg and vanilla extract to the butter mixture, creaming until combined. 6. Alternatively in three stages, add the dry ingredients and the milk to the butter and eggs, making sure to mix thoroughly between each addition. 7. Using a piping bag with a large round tip or an ice cream scoop, pour the batter into round shapes on baking sheet lined with a silpat or parchment paper, making sure to leave at least 3-4 inches between each cake. 8. Bake for 12-15 minutes, adjusting for the size of the whoopie pies. 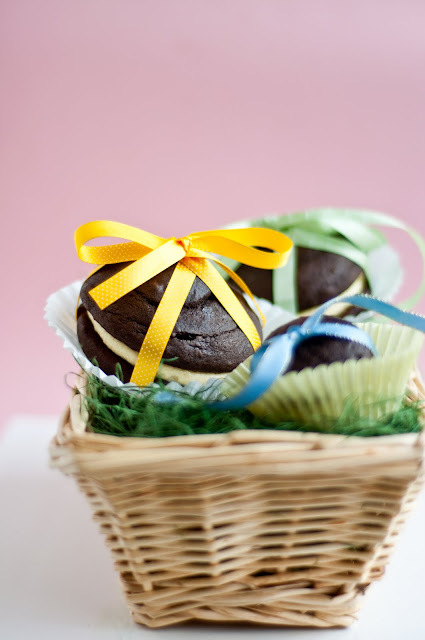 Cakes are done when they are springy and retain their shape when gently touched. 9. Remove from oven and let cool completely before filling with frosting. 1. Have ready a fine mesh strainer over a bowl. 2. Combine ingredients in a double boiler. Cook, stirring constantly, until thickened. 3. Immediately strain through the mesh strainer and let cool completely. 1. Place milk in a medium saucepan. Scrape in the vanilla bean and throw the whole bean in. Bring to a simmer, remove from heat, cover, and let steep for ten minutes. 2. Remove the vanilla bean from the milk. Add the flour. Whisking constantly, cook the milk and flour until the mixture thickens. Remove from heat and let cool completely. 3. In a mixer bowl, cream the butter and sugar together until light and fluffy, about five minutes. 4. Add the passion fruit curd to the butter and whip until combined. 5. Add the thickened milk mixture to the butter and passion fruit, whisking until light, whipped, and fluffy. Use immediately. 6. Pipe the passion fruit frosting onto a cake round and then sandwich with another cake. Refrigerate to allow the frosting to set before serving. I love seeing all the different types of whoopie pies out there. Have to say, these are most creative. These are beautiful! Wish I was munching on one of these babies right now. Gorgeous post, those whoopies look so cute wrapped in their ribbons. The ribbons are so lovely! 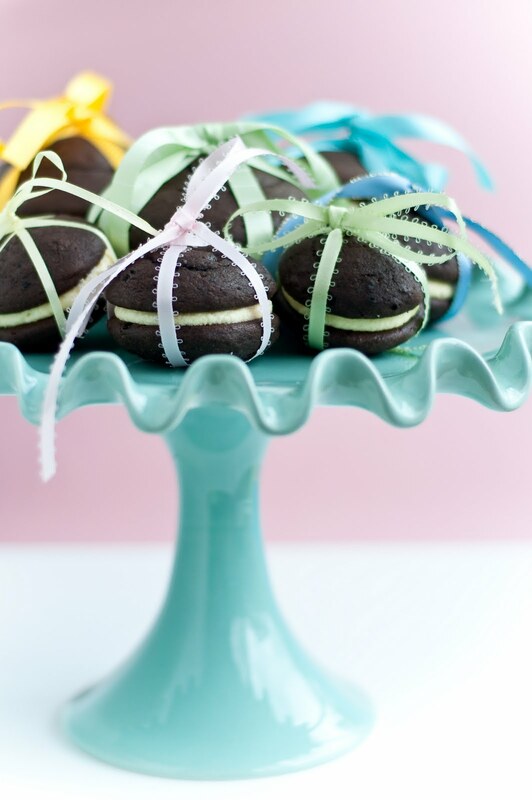 I love that you made mini whoopie pies, they look like a few really delicious bites! @Rick: yes! 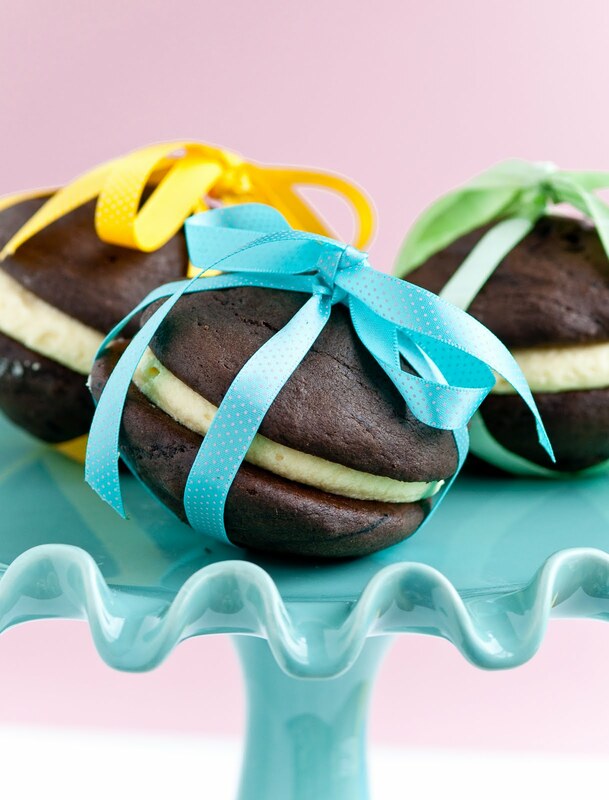 whoopie pies, like most of the desserts in the "sandwich" category are really super versatile for bunches of wacky flavor combos. @Michelle: fresh passion fruit is hard to come by. that's why i like the bottled juice/syrup that you can find at Asian markets. where are you located? maybe i can help? maybe I'll jump and make your recipe this weekend. These are super cute! I Love your blue cake stand too! You (and 100 other bloggers) beat me 8). 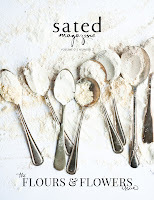 I've been dying to try that flour paste frosting (not quite as nice sounding a name, huh?). While we're asking each other where to buy things, where do you buy passionfruit and is it only available certain parts of the year? I've never seen it in our regular grocers, but I'm hoping the massive Asian ones will have it. 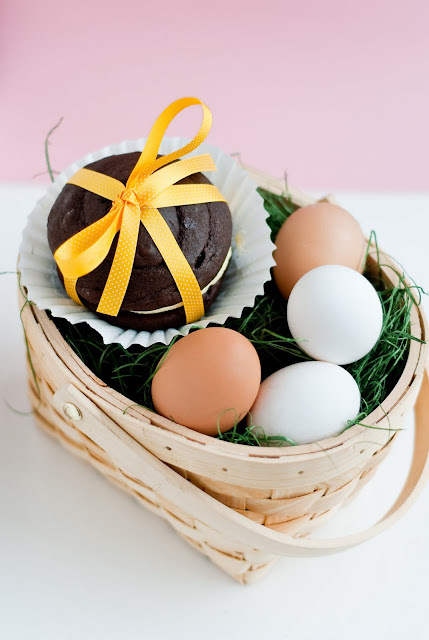 These whoopie pies are so cute I'd (almost) hesitate to eat them. Hi - can you clarify your ingredients for me? Is it 1/4 + 1/8 cup regular cocoa powder then an additional 1/8 black cocoa powder for a total of 1/2 cup cocoa powder? Or is it 1/4 cup regular + 1/8 black? @larkyn: oops, sorry it was unclear! It's 6 Tbspn of regular cocoa powder total and 2 Tbspn of black cocoa powder, bringing it to a total of 1/2 cup of cocoa powder.